Rarely has the Tamil speaking world witnessed a person who combines all the qualities of a saint, a scholar, an orator, a writer, and a devotee. Tiru Muruga Kripananda Variyar carved a niche for himself in the field of literature and devotion. He was the embodiment of devotion. He has identified himself with Lord Muruga so deeply that it is difficult to think of one without the other. People came from far and near in large number just to listen to his discourse and experience his grace. Whatever subject he spoke on, Tiruppugazh or Ramayana, he instantly established a rapport with the audience and elevated them to a new world of music, devotion and knowledge. “He came, spoke and conquered,” described a devotee. It was not in India alone that he gave the message of devotion. He captivated the hearts of Muruga devotees not only in India but in different parts of the world like Sri Lanka, Singapore, Malaysia, and USA. 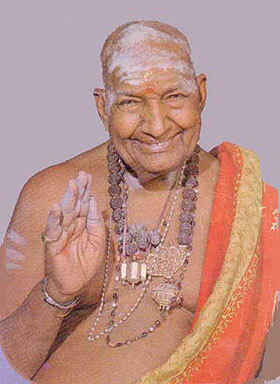 He was Tiru Muruga Kripananda Variyar, the doyen who has occupied a special place in the heart of Tamils. Mallaya Dasar and Kanakavalli, a couple who hailed from Senguntha Veera Saiva community and settled in Kangeyanallur Village in Vellore District, were blessed with eleven children. Kripanandar was the fourth child, born in the year 1906. Mallaya Dasar, who was well versed in the art of music and devotional discourse, named this child as Kripananda Vari. The word ‘Kripa’ means compassion and kindness, ‘Ananda’ means bliss and ‘Vari’ means shower. In the true spirit of his name Kripananda Vari immersed all his audiences with his shower of devotional music and elevated them to a high state of bliss. With his own father serving as the guide, master and philosopher, Kripananda Vari rose to be a great man of letters and an eloquent speaker on devotion. Even when Kripananda was three years old, his father started teaching him the basic lessons of language, literature and spirituality. When he reached the age of eight he started composing and singing. He became well versed in Tevaram, Tiruppugazh, Tiru Arutpa, Kanda Puranam, Kamba Ramayanam, Villi Bharatam and knew over 10,000 songs by heart.  He composed certain hard and complex poems and songs like Ashta Naga Bhandam, hymns on Vel (lance) and Mayil (peacock) which even learned pundits could not easily comprehend. Mallaya Dasar was acclaimed as a luminary in the art of musical discourses. Invitations came to him from different places and temples to perform devotional discourse. One day, due to some obligation, Mallaya Dasar could not visit a particular place as promised, so he sent his son Kripanandar to perform the task. On seeing the young Kripanandar, the organizers wondered how Mallaya Dasar, having agreed to come and give the discourse, has deputed his young boy in his place. They doubted whether this boy could fulfill the high expectations of the audience. But the moment the audience started listening, they were spellbound. ‘What a great knowledge at such a young age!” they wondered. Variyar was eighteen at that time and in keeping with his age, the discourse he delivered was so simple and clear that even the illiterates could understand it. 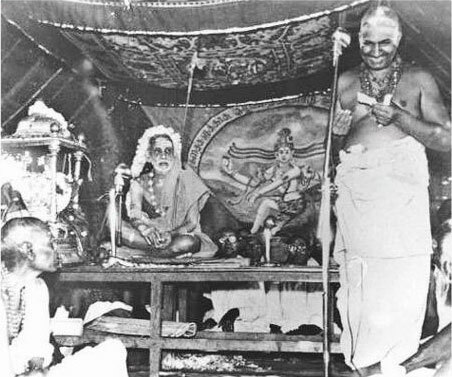 Thereafter, wherever Variyar rendered, people came in large number because they knew Variyar could give them all they wanted: devotion, doctrines, and divine messages, combined with humour. When he was 21 years old, his father took Variyar to the Navaratri festival held at Mysore. At that time, his father got the veena instrument from the luminary Veena Seshanna and gave it to his son, Kripananda Vari. When Variyar was 23 years old, he received training on Veena from Thenmadom Brahmasri Varadachariyar in Chennai for about four years. Later, while rendering discourses, he started reciting Thiruppugazh, Thevaram and Thiruvachakam. He evinced great interest in music and even done some research on it. He said Lord Siva was the source from which music originated and was later developed by Muruga. Variyar used to say that it was Muruga who first played the flute instrument by cutting the branches from the tree while residing in the Kurinji region. While describing the divinity of music, Saint Tiruvallur first spoke about the flute instrument and then about the instrumental music. Variyar has described the family of Lord Siva as the family of musicians. Variyar had a special love and affection towards children. Invariably, before addressing his audience, he asked all the children to come near him and sit in front. In the midst of his discourse, he used to ask some simple question and give the price of a book to one who gave the correct answer. Even when a child gives a wrong answer, Variyar would give him some tips by which the child could the answer correctly. Variyar always kept some devotional books ready to be distributed to the child who answered his simple question on devotional matters correctly. However, at the end of the discourse, he used to give every child a copy of the book and explained the value of reciting these prayers. This was his way of motivating children to devotional path. (In his young age, this writer had the good fortune of sitting in the front row of Variyar’s discourse in connection with the festival of Navaratri at Varasidhi Vinayagar temple at Theni). He knew the importance of kindling the light of devotion and moral values at a very early stage in life so that even when they grow up they live up to high ideals. Variyar had the quality of keeping his audience absorbed in his discourse and rarely anyone got up in the midst of his discourse. One day, when Variyar was seriously speaking, two persons from the audience got up to leave. As the audience attention was turned towards them, Variyar said: “Hanuman is known as the man of letters”. “Similarly”, he added “there are men who leave away from letters.” Variyar here used the Tamil words sollin selvar. The word selvar means ‘popular’ or ‘high personality’ and when it is used as sollin selvar it means ‘men of letters’. The word selvar also means one who departs. So sollin selvar also means one who walks away from hearing words of wisdom. Having heard this interpretation, the embarrassed persons went back to their seat and remained till Variyar completed his discourse. When Variyar spoke, invariably the hall was packed to capacity and a sizable section of the audience was women. Variyar held woman in high respect. If anyone spoke ill of women, Variyar would explain with reason why a woman should be treated with respect, dignity, love and understanding. If a wife sheds tear, that home would never prosper” he used to say. It was Variyar who first brought out the idea of putting mother’s name as the initial for the child. Since many cases of harassment of women were reported in Tamil Nadu, Variyar emphasized the need to give woman a high position in the society. When there are visitors to the house, the husband should publicly acknowledge the importance of his wife and praise her qualities to all others. “From time immemorial we have been adopting the practice of naming the child after the father. There is no history of man delivering a baby. It was only Lord Shiva who created from his third eye a baby who has come to be known as Muruga. Muruga alone is muscular because he is born to a masculine person and we are all females because we are born to feminine person. A female symbolizes tenderness, softness, humbleness and humility and male symbolizes courage, valour and strength. Similarly, there are certain characteristic qualities for God also. What are those qualities? Firstly, a god has no birth or death. He knows what our needs and aspirations are. I am stating this after undergoing many experiences and reading scriptures. He who is born and dies cannot be called as a god. He is also an Atman just as we are all. There is no birth or death for Lord Siva. Muruga is the manifestation of Siva and Sakti. Therefore, there is no birth for Muruga also. Arunagirinathar says that the Lord who stole the red deer’s daughter Valli from her abode has no birth or death (Semman Magalai Tirudum Tirudan...). We all celebrate the birthday of Lord Sriramachandra as Ramanavami and the birthday of Lord Krishna as Janmashtami. Similarly we find Jayanthi festivals for Hanuman, Madhva, Ramanu, Parasurama, Vamana etc. But do we find any temple celebrating Siva Jayanthi or Muruga Jayanthi? No, because God is beyond birth and death. 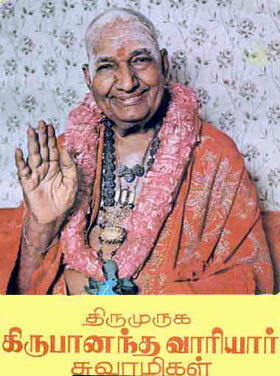 Variyar Swamigal had studied the doctrine of Saiva Siddhantam in detail and lived like a Saivite saint. He was an erudite scholar and an eloquent speaker. When he spoke, words flowed freely like river Ganga and people appreciated the pearls of wisdom that emanated from his discourse. People from all walks of life used to turn up to the venue to listen to his scholarly speech. He was endowed with good memory power and he recalled events from Purana with remarkable ease. He used to quote freely from Thiru Murugatru Padai, Thiruppugazh, Thevaram, Thiruvachakam, Kandar Alamgaram, Kandar Anubhuti Vel Virutham, Mayil Virutham, Thiru Vakuppu and Thiru Arutpa, and his listeners would be captivated by his erudition, knowledge and wisdom. In recognition of his knowledge in music, the Madras Thamizh Isai Manram honoured him with the title Isai Per Arignar (Luminary in Music). There was none to equal him in giving discourse with the right mix of devotion, knowledge and humour. People gathered in large number to hear him because he possessed the ability to impart high spiritual doctrines in a perceptible manner and even with a sense of humour. While he was rendering discourse at Thirupparam Kundram, a gentleman from the audience got up and asked Variyar Swamigal: “Swamigal, what is your opinion about the demand among Muslims to change the name of Thirupparam Kundram mountain into Sikkandar Mountain?” “One of the name of Muruga is Kandan. Since Siva is the father of Kandan, the son naturally carries the initial of his father “Si”. So, to call him as Si Kandar is very appropriate” replied Variyar Swamigal. He was very universal in outlook and he even adopted certain aspects from Islamic teachings. 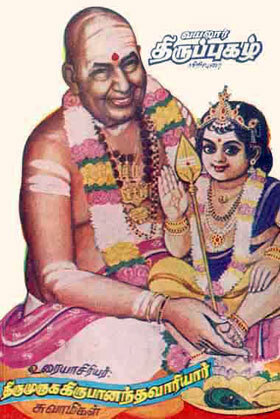 Though Variyar spoke eloquently in Tamil, worshipped Muruga as the God of the Tamils and rendered devotional songs in beautiful Tamil verses, there were people who criticized him as supporter of North Indian language, implying his love for Sanskrit. Variyar held Tamil language in high esteem, unparalleled in its beauty. He cited the instance of Lord Siva’s marriage with Uma when the whole pundits, devotees, saints and Devas had assembled at Kailasa to witness the rare spectacle. The congregation was so heavy that the northern arena started tilting downwards by the weight of the people and the southern arena was moving up. According to legend, Lord Siva then deputed Agasthyar to go to South to balance the land and to help him in his task, Lord Siva taught him basic lessons on Tamil. With this knowledge, Agasthyar sowed the seed of Tamil Language in South and composed many songs on Tamil but unfortunately in the passage of time many such songs got lost. It is estimated that this event took place around 5,000 years before. Later, one of the disciples of Agasthyar, Thol Kappiyar, scripted Tamil literature which is now known as Thol Kappiyam. We humans have four kinds of actions; sitting, lying down, standing and walking. There are four ages, Kruta Yuga, Treta Yuga, Dwapara Yuga and Kali Yuga. There are four regions, Kurinji, Mullai, Marutham, Neydhal. There are four characters for woman; modesty, shyness, restraint and compassion. There are four characters for men; knowledge, courage, happiness and family bound. Thus almost all fields of human activity have been defined in Thol Kappiyam. Thol Kappier has defined the earth and the hill in great details. Apart from rendering discourses, Variyar Swamigal was famous for his writing talent also. After hearing his discourses on Thiruppugazh, some devotees requested him to publish books giving the detailed meaning and interpretations. In 1936, he went to Vadalur Sathya Jnana Sabhai and released the book Thiruppugazh Amrutam. This magazine became very popular and people patronized it whole heartedly. In every issue, he gave detailed meaning for one Thiruppugazh song and Kandar Anubhuti and Alamgaram. It remained as a foremost Tamil devotional magazine for over 37 years. A comprehensive book was compiled by including all his articles appeared in ‘Thiruppugazh Amrutam’. It was a great store-house of knowledge. He has also written books on moral principles which are considered highly valuable. He wrote them in simple language and easily understandable to the common man. Being a many splendoured personality, Kripananda Variyar has played roles in films too. Apart from writing dialogues for the film Sivakavi, in which Thyagaraja Bhagawathar had the lead role, Variyar also appeared in small roles in films like Thunaivan, Thiruvarul, Deivam etc. He has been conferred with the title ‘Ponmana Semmal’ by former Chief Minister, Thiru M.G. Ramachandran. Pamban Swamigal was considered as the manifestation of Arunagirinathar in the 20th century. It is believed that Pamban Swamigal had experienced the presence of Muruga and received the blessings of the Lord. Once, Variyar Swamigal visited Thirunaraiyur to render a religious discourse. On the night prior to the day of his discourse, Sri Pamban Swamigal appeared in the dream of Variyar Swamigal and rendered the rare advice (Sadakra Mantra). Variyar Swamigal himself revealed this in his biography. 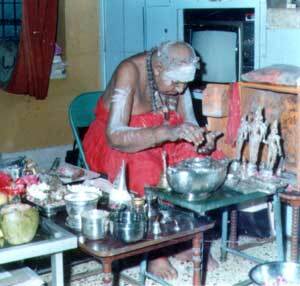 Worshipping Muruga and doing puja constituted the daily ritual of Variyar Swamigal. He might be away from home or he might be travelling, but never once did he deviated from his practice of conducting puja to Muruga. It seemed that even when he breathed, it evoked the sound as ‘Muruga’ ‘Muruga’. Variyar always stressed the necessity of upholding moral and ethical values in our day to day life and he lived as an ideal example of a perfect human personality (Uttama Purusha). He used to observe austerity and abstinence on every Monday, beginning from the month of Karthigai and continued the practice on every succeeding Monday for five times. Wherever there are Muruga temples, Variyar went there and worshipped Muruga and rendered whatever service he could. But Variyar nourished a special fascination for Vayalur Muruga and whenever he started his discourse, he began by worshipping the Lord of Vayalur. Variyar Swamigal was a great philanthropist. He donated whatever he possessed to the Muruga temple at Kangeyanallur. He contributed liberally to the service organization ‘Ramakrishna Kudil’, founded by Brahmachari Ramaswamy at Thirupparayathurai on the Trichy-Karur trunk route. He donated to various cultural, religious and educational institutions. 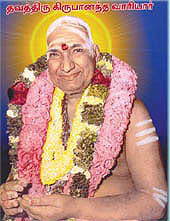 He was instrumental in renovating many old temples and construction of new temples in Tamil Nadu and beyond. Once, a person asked Variyar, “Why should we worship God?” “Even animals live by eating and breeding their race,” Variyar replied. Man is endowed with the power of discrimination. He should elevate himself high, live as a perfect human, rendering help to all the needy and attaining the divine status. Variyar received many honours and awards. Among the many awards he received, Kalai Mamani Award, Tiruppugazh Jyothi ('The Light of Tiruppugazh'), Pravachana Samrat ('King among Orators'), Isai Perarasar, ('Prince Among Musicians') are a few. Once, while staying at London Variyar’s health condition became a cause for concern. In November 1993, he returned by a flight bound for Bombay and from there to Madras. 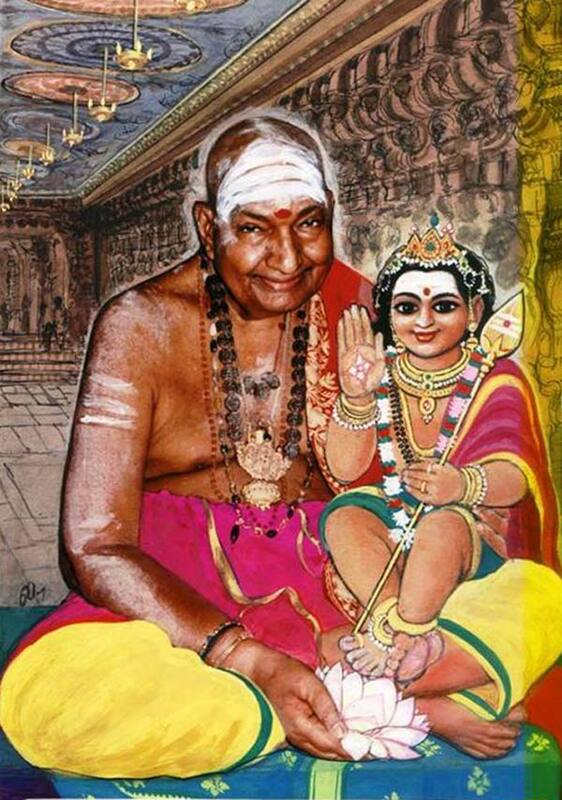 Unfortunately, by the time his flight reached Madras, Variyar Swamigal had attained the lotus feet of Lord Muruga. 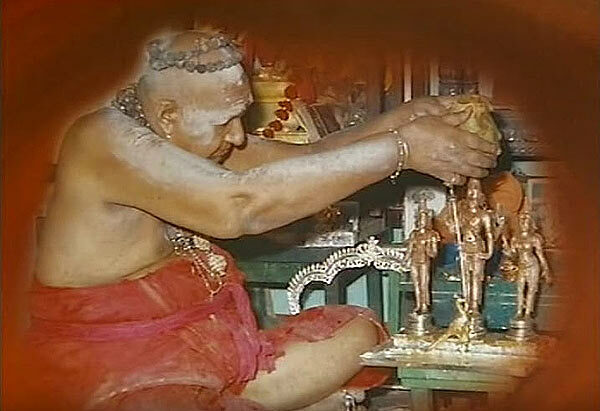 Innumerable devotees of Muruga felt a personal loss at the demise of Variyar Swamigal. The loss of Variyar Swamigal was a great loss to the world of devotees. But though Variyar Swamigal has disappeared physically, he is present everywhere in Tamil Nadu in the form of various books on Thiruppugazh he has written. The Muruga devotion which he cultivated in the heart of the people has grown like a giant banyan tree, yielding the fruits of devotion all over. Visit Thiruppugazh.org - Glory to Lord Muruga!